Sorry Hobbio! Anyways, ploughing onwards, we reach more recent times. About 2006/2007 I started to feel I should be doing more with the guitar, and "get out there" a bit more. I had started noodling with jazz stuff at home more, and strangely, it seemed to me I was improved (matured? ) as a jazz player, despite not doing it much for quite a while. Maybe time helps in some ways, plus I suppose I have always listened to a lot of jazz, so that has an effect I would think. So, encouraged by a good friend, I went to the local jazz society's annual "players evening" and got to sit in with the house band for a few numbers. Also at one point I found myself accompanying a lady singer, who I thought was just terrific, though I felt completely out of my depth lol! Anyway I got invited to sit in with the band a week later at a local pub, and these days I now play in that band regularly. Also I got asked to join another band that featured the lady singer, so that went on for a while - then for various reasons we both left, but we now work as a duo (she plays bass as well as sings) - it's about my favourite thing I've done musically. And I got asked to join yet another band that had heard me on the players night, this band tends to do more function work and the dreaded "smooth jazz" kind of stuff - dinner jazz if you like, but it's still good to do. And during the last few years, I've probably practiced and developed my jazz more than I ever did in the past. So it's all good! You can see from the thread that it took me from July all the way to November to finish it, and then there was still a bit of messing about with the electrics needed to get it working properly. I later changed the pickups to a set bought from this chap on ebay, who I would recommend to anyone Chris Hernandez (the ad is for strat pickups, but he will do whatever you want if you get in touch). And I'm biased, but it's just a lovely guitar, really nice to have around and practice on - it does the classic tele twang to a tee, but also a rather nice, delicate kind of jazz tone from the neck pickup if you back off the volume and tone a little (especially using the Polytone amp). I'm rather proud of it in fact! Excellent read.......but i LOVE that tele! If i could have any tele right now, it would be yours megi! Thank you zog, that is quite a compliment, and much appreciated! Just going on to the next guitar, which I bought on a bit of a whim (a sudden GAS attack really! ), in September 2011, so before the tele was complete. I had for a while had it in mind that a nice semi-acoustic would be a useful axe for me to have, good for jazz, and a bit slimmer and easier to use than the Ibanez archtop, especially in cramped pubs when I'm lodged in a small area to the left of the keyboard player! But... ...I'm just not a fan of the Gibson 335 type design that is used for most semi acoustics - the bridge is placed so far up towards the waist of the body, that you get this big bulbous lower bout sticking out at the side. Plus the 16 inch lower bout width just seems too big to me - that's wider than some fully hollow jazz guitars, and for a semi acoustic, where you have a solid block running down the centre, it just seems OTT! These are just my personal bias of course, don't be offended 335 owners! But anyway, the idea of something a bit more streamlined had some appeal for me, and then one day while browsing, I spotted, you guessed it ... the SHINE SIL510 on Chase Direct's website. A bit of research about the guitar on the web (as far as I could), and the price was so low I couldn't help but take the risk. A couple of days later I had the guitar, and it was pretty nice as it came. After a while I realised the pickups were just a bit fierce for my taste (perhaps better for rock) and I bought and fitted some Alnico 2 PAF "Bourbon City" pickups from Axesrus, which seem to have done the trick. I've also done a bit of work levelling and polishing the frets (though they were quite good to start with) and recently fitted a bone nut (though again the stock one was reasonably good). And it is now possibly my most used guitar! as well as the cheapest to buy. I honestly feel I personally would prefer it to a Gibson 335, despite the much lower price - it makes a great sound for jazz with the new pickups, and feels so comfortable to use. I would swap it for the Gibson, but only so I could sell the Gibson, buy another Shine and pocket the difference lol. If I had the cash I'd buy a Shine, £95 is a bargain. What a great collection of guitars and a fascinating "history of" story. I think Odyssey is just the right word. Interesting too that, in this collection of some damn good guitars and many years experience, the Shine at such a budget price really was such a special buy for you. It does looks startingly good too. I've been finding that creature creeping into my head too, the little green devil. But for me the jealousy is more that you have had such a fruitful long term relationship with guitars Graham. I do regret what seem like far too many years where I either didn't play or made such a half-assed job of trying to. Years that don't come around again, and much fewer years left to try to get better at playing. Ooops ... didn't want to bring down the mood! Not been a great week ... that's my lame excuse. Mine was even more of a bargain......it was only £75!!! I've been finding that creature creeping into my head too, the little green devil. But for me the jealousy is more that you have had such a fruitful long term relationship with guitars Graham. I do regret what seem like far too many years where I either didn't play or made such a half-assed job of trying to. Years that don't come around again, and much fewer years left to try to get better at playing..
Mark, I agree with your sentiment completely! I too feel pants of jealousy at the rich history others have had! Seeing such a variety of guitars on show and different paths people have taken certainly triggers the green eyed monster a little bit. I'm glad I have now started, but do wish it was at least 10 years ago I began! I've sat there for over a decade without playing mate. For myself, I must admit I feel rather guilty for my younger self - I guess I was full of the confidence of youth at the time, but I now feel I was rather irresponsible, and also that I somewhat wasted the opportunity/privilege of music college. Maybe if I'd worked harder at the time, I would have got further than I have. Now I'm older, I try a lot harder with my music, but of course it's not quite so easy to learn as when one is young. Blumin heck, I'm coming over all reflective as well now - at least we all have music and creativity in our lives, which I think is just a great thing - I'm certainly thankful for that! That was bad of me, apologies Hobbio. Really I've ended up doing it to myself though, I'm seriously thinking if I should buy another of those Shines now! Aaaaggghhh! It'll happen only if funds allow, and if I miss out I miss out. There's an outside chance, but with a potential project and a 12 string on the cards as well it's not too likely. Pity, I do like the look of it and the reviews here are great! Ah well, at least you're aware it's there (lol, how could you not be? ). I'm still teetering on the brink a bit at the mo! Anyway, I guess enough Shine talk for now ha ha! So on with the guitar history, and we come to the strat build! It's funny looking at the dates involved, but it seems like I started on the strat project almost immediately after the tele was finished, if not slightly before! The strat build thread starts at the end of October 2011, and records the guitar as being completed at the end of January 2012 - so it was a winter project - I do remember spending a few chilly hours working in the garage, listening to radio 4, which seemed to help. The thread is here btw strat build thread - it's a bit of a marathon, but I wanted to record as much detail as I could. Unfortunately the pictures don't show any more, but they can still be viewed in reverse order in my photobucket album, which is linked to at the bottom of all my posts. So anyone keen enough could work out what goes where in the thread. Before I started on the build, I had planned to put decent strat pickups in my Starfield guitar (see earlier) and also strip the finish on this guitar, give it a tru-oil treatment, and maybe fit a new quality trem unit. Unfortunately it just didn't work out - the body wood turned out to be unusable for a natural finish, and basically I realised it was just going to be a heck of a difficult job. And probably the result would be dissapointing, even if I managed to complete it. So in the end, the fresh build from scratch was more appealing, and easier for me to do as well. I don't want to sound too smug, but this guitar turned out pretty awesome too. I love it to bits really, it really cheers me up sometimes to just look at it! And it's a great feeling to know that it is basically unique, despite being one of the most popular designs of all time - I guess the same applies to the tele as well. I've not found a great jazz tone on the strat I have to say, but I still just love the design, and I am a huge fan of Eric Johnson, and I guess the strat is perfect for doing a bit of EJ style chord work. The pickups on the guitar I had made by Chris Hernandez (see in the tele entry for a link) - he made them to specs I gave him after researching what Eric Johnson has in his Fender model strat. Another unusual feature is the ebony fingerboard, not really "correct" for a strat, but I don't care, I've always had a thing for ebony fingerboards - it just seems to be a touch of luxury to me, not that it's really better or anything. I have the guitar set up with fairly heavy gauge 11-48 strings, but I still find I'm able to do bends and vibrato well enough. It's a really resonant and bright sounding guitar, and the pickups have plenty of top-end shimmer to them as well (the neck and middle have alnico 3 magnets, which may help give this quality). Anyhow, it's been displayed on this forum plenty of times already, so enough of that! Hobbio, if it is between the Shine or a 12 string, I would say go for the one that won't be there when you have saved up for your next guitar. Megi, thanks for the jazz odyssey; it has been great to know the person behind the forum entries. One fo the things I admire about you, Megi, is how you have got to grips with the electrics. I am impressed that you know what a certain type of Alnico pickup will sound like. I have a similar level of understanding with woods but not the electrics. I need to get to grips with that aspect, as my story will soon explain. I spend too much time reading stuff on the web Lester! That's really just something I've heard said about Alnico 3 magnets a few times - they apparently have the lowest magnetic pull of all the various magnets used in pickups, which is good for allowing the string to vibrate more freely. But I've never tested these things scientifically. I do have a currently unused Tonerider Alnico 4 humbucker that I've never really liked very much, and I have thoughts of changing the magnet in that to see what effect, if any it has. But I'll first need a guitar to put the pickup in! which is a dangerous thought! You are being very intreguing lately I must say, is this need to get to grips with the electrics anything to do with a recent purchase? Well, we arrive at the most recent purchase in the guitar history, which is another Shine, at the beginning of September 2012 - an active 5 string bass, with a satin-finished bubinga body and an oil-finished maple/rosewood neck. It was yet another Chase Direct bargain - I don't know what the full price would have been, but I'm sure the £117 + p&p I paid must amount to a fairly hefty reduction. To be fair, there were a few issues with it when it arrived, which if I'd paid more, would have caused me to send it back. Given the low price, and the fact that I could fix the issues, and I really liked the bass ...I have kept it. I think the heavy, very hard wood bubinga body (and it's really heavy - need to get a padded, extra-wide strap!) gives it a particular kind of deep resonance, and lots of sustain. It balances very well used either sitting down or on a strap. I didn't really need a 5 string - I just thought it would useful to have a bass around really - but being me, I suppose I had to be a bit "flash", and that said, I do quite like having the low B string there now. It's a bit surprising to me just how enjoyable playing bass can be - one day I'll have to try and find a band to play bass in! And that's the potted guitar-history brought just about up to date, but not, I suspect, over! Is there a 12 string in your collection? Oh, if my numbers came up the first guitar I'd order is a custom Crimson. Neck through, double cutaway, Bubinga , HHH with a sustainer, brass frets and nut, gold hardware. I was talking earlier about stuff I've been working on in recent years - one of the things has been working out my preferred system of scale shapes to use when improvising. I think for me the two most important scale families are the Major Scale and it's modes, and also the Jazz Minor (aka melodic minor) plus it's modes. I've been testing out the "Neck Diagrams" software lately, so I thought what the heck, why not use it to show my scale patterns, so these are my major scale ones. The black and red dots show the main pattern (so learn first), but I also include alternative places to find some of the notes, plus a few extra ones at the top end of the pattern - these are shown in blue. The system is basically one using 7 patterns to cover the fingerboard, but with these extra or alternative notes, the system also incorporates the "CAGED" 5 pattern system, and the 3 note per string approach favoured by people like Frank Gambale. In general, the idea is to have alternatives and not be limited. I haven't indicated any fingerings, since I like to keep this aspect flexible also - for me it's the shape of the pattern itself that is most important. Not trying to set myself up as a guru or anything! it's just in case of interest to anyone. For me I would say that the major scale itself, plus the Dorian minor and Mixolydian modes are the most useful, then the Locrian is also good for minor 7 flat 5 type chords, Lydian is also nice over major chords, and the Aolian minor occasionally useful I guess. I haven't really got to the Phrygian mode yet I admit. 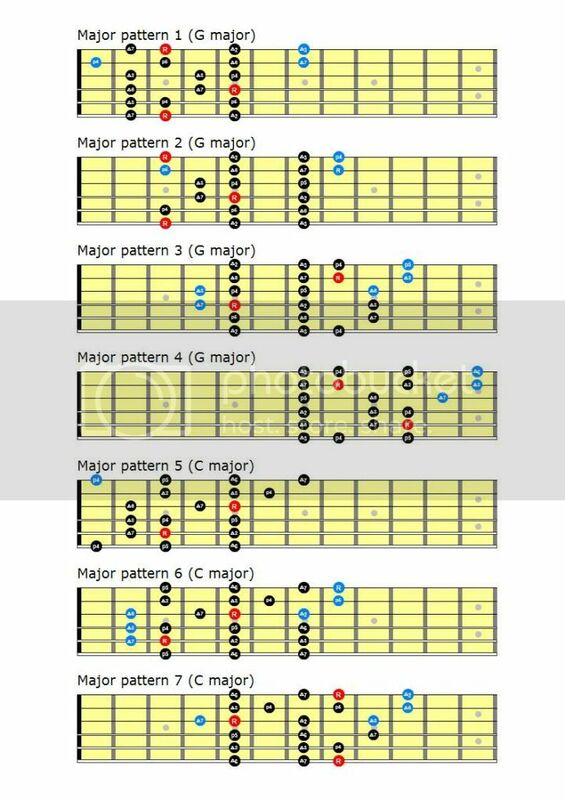 Also the various arpeggios you can derive from these scale shapes are important for jazz, plus I think you need to have a repertoire of musical lines (licks if you like) in each pattern area. And it's good to use chromatic, non-scale notes as well - things like passing notes and enclosure , otherwise things can sound a bit rigid and mechanical sometimes. It all adds up to a lot of work really , I've been seriously going at this stuff for the last few years, although to some extent for long before that even (decades! ) but it is the last 3 years or so when I have figured out that this is the detailed approach that works best for me. Hope it might help someone out there in some way lol, back with the jazz minor shapes before long! - the Lydian Dominant, for dominant 7th chords that don't resolve down a 5th (but it also works for any dominant 7th type chord pretty much). - the Altered Scale (aka "Super Locrian"), for dominant chords that do resolve down a 5th. - the 6th mode of the Melodic Minor (not sure what it's called really) for minor 7 flat 5 chords(aka "half-diminished" chords). 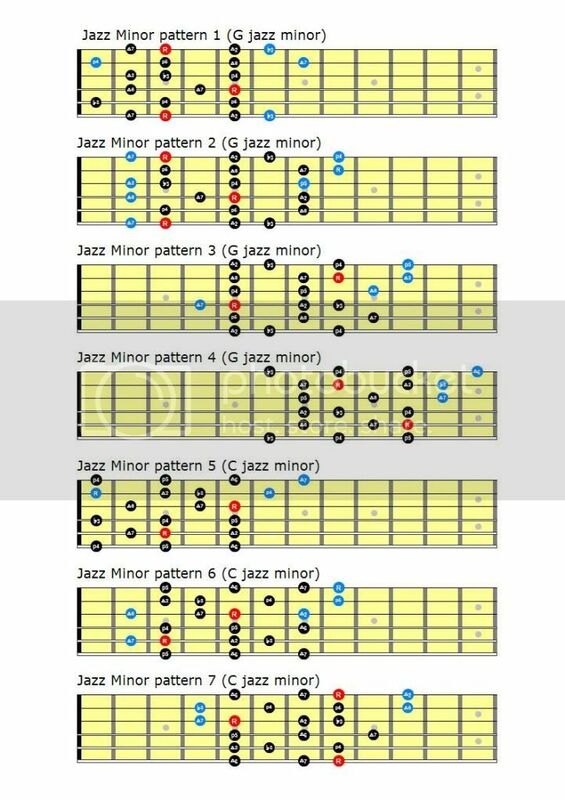 If you derive all the "minor 9th with major 7th" arpeggios from these Jazz Minor shapes, the cool thing is they work really well in all the chords situations listed above.